It is always nice to have gifts that are unique. A gift that has meaning, and of course is special to you and others. 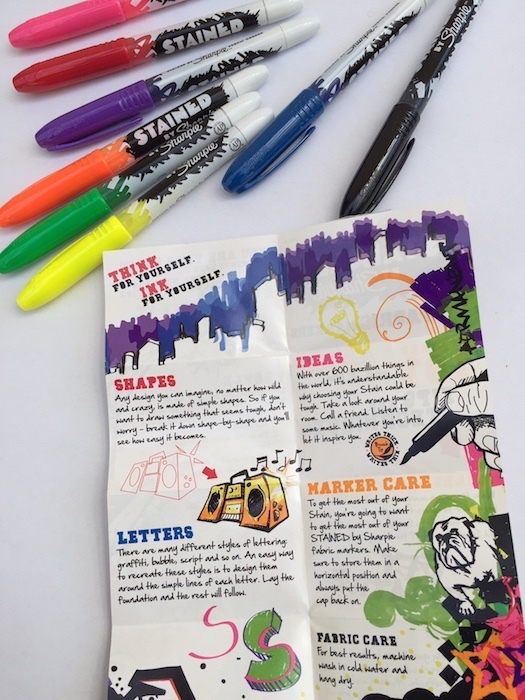 Creating a gift that is a work of art is even better. 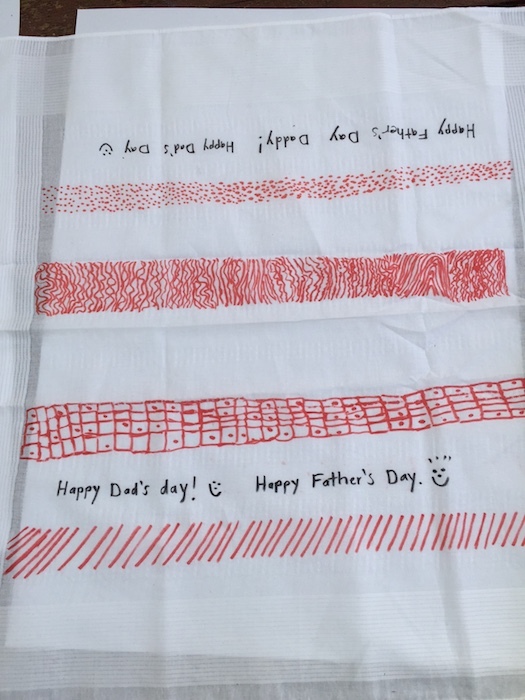 How about decorating a handkerchief for dad, mum, or anyone! This gift idea is not only just for dads but can be for mum, grandparents, friends or even as a teacher gift. Yes, this idea is easily adapted to whoever you wish to give it to. It just depends on your imagination. This simple DIY gift is super easy to create and won’t cost the earth. Handkerchiefs – You can purchase some or even make some if you are crafty at sewing. I purchased plain white ones. You can get different colours with patterns if you wish and incorporate this into your design. 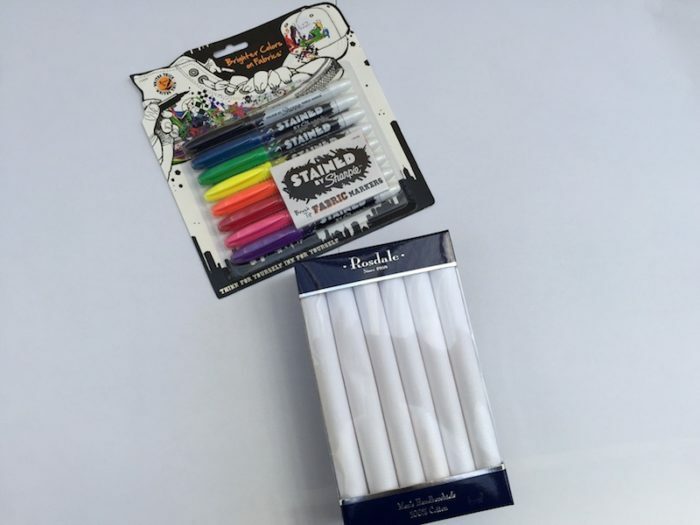 Cardboard or paper to put on desk to make sure that the pens don’t bleed onto the desk. Before you get started with your design it is always advisable to think about what you would like to achieve. For my first attempt at decorating the handkerchief, I just stuck to patterns in one colour. I alternated rows to give it a better visual effect. As the handkerchief had a pattern on the border I decided to not decorate there and leave the pattern the way it was originally. Once the patterns in the red colour were finished, I then added some text on one side of the handkerchief and did it on the other end, and it is upside down from each other. This was done on purpose to make sure the text can be read no matter which way you have the handkerchief. I was going to iron the handkerchief afterwards to heat set but have read that this is not needed for the Sharpie pens. One post that I read recommended leaving the decoration for an hour to set. Lillian working on her masterpiece for daddy. The twins have both decorated their own handkerchiefs for daddy and I think they look amazing. If you need a quick gift I would give this a go. I’m sure he will not have anything like it and of course love the fact that it is such a personal gift. 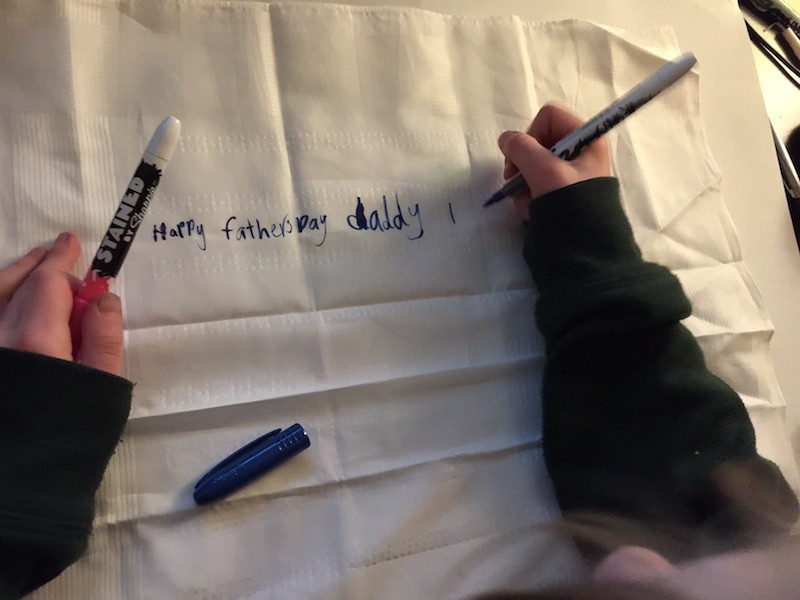 Julia creating her own colourful handkerchief for daddy. 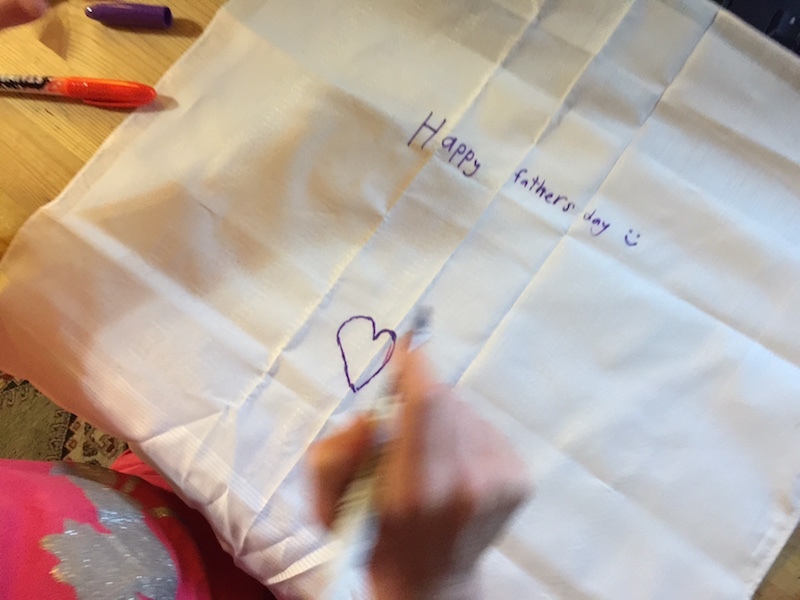 If you do create a handkerchief decorated with sharpies for Father’s Day it would be amazing if you could share your pictures on our Facebook Page. I am sure that we can gain inspiration from your creations. My first attempt at using Stained Sharpie Pens to decorate a handkerchief for hubby. Thanks for following another great craft idea from Mummy to Twins Plus One. Stay tuned for more on the blog soon. 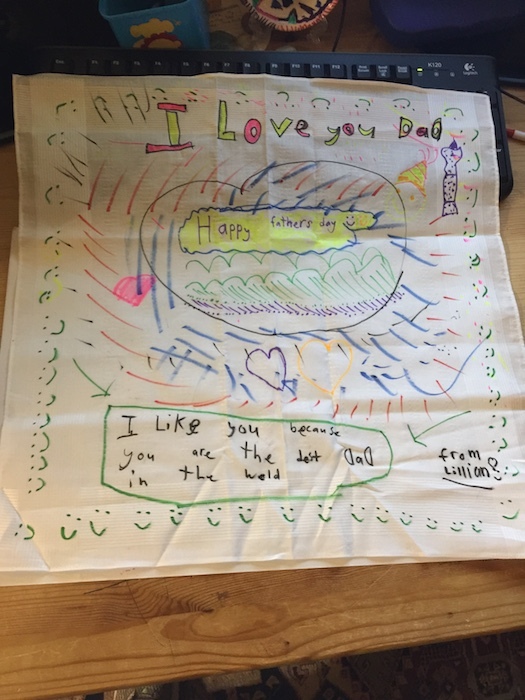 Julia’s finished artwork on a handkerchief for Father’s Day. 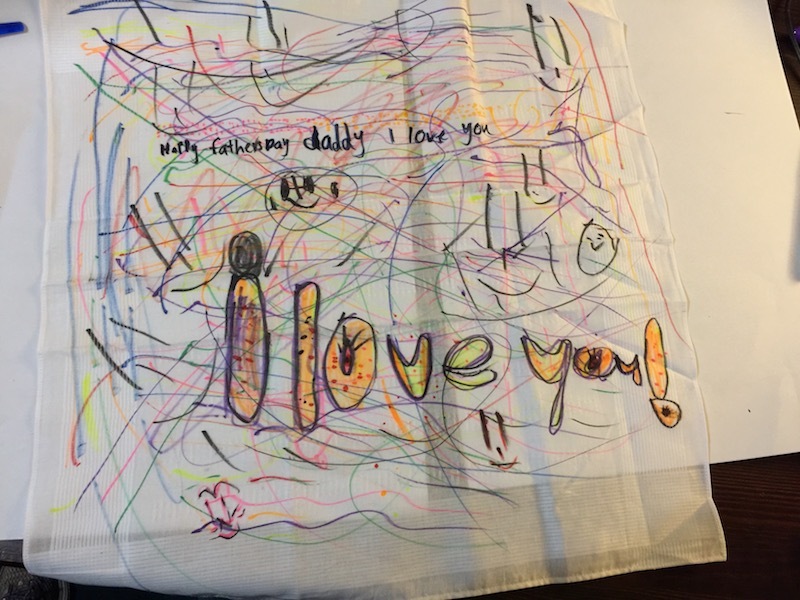 Lillian’s brightly coloured Sharpie coloured handkerchief for daddy.